It’s a microcosm of the season, really. 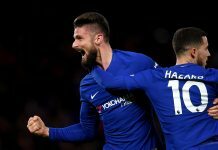 Every time Chelsea appear to be gaining a bit of momentum and regaining the confidence of champions, a sucker punch arrives, and the Blues are left back at square one. This time, the visit of old nemesis Tony Pulis and his West Bromwich Albion side produced a 2-2 draw at Stamford Bridge, and you can’t really argue that the visitors didn’t deserve a point. The Baggies came from behind twice through goals from Craig Gardner and James McClean and maintain their 13th position, 3 points ahead of the Blues. It didn’t start that poorly. Chelsea started the match on top and were ahead after 20 minutes. Branislav Ivanovic’s excellent cross from the right was turned in by a rampaging Cesar Azpilicueta at the far post, as the hosts celebrated the early goal. However, once more, the nervous energy returned to the Blues, and Pedro may have had one of his worst matches in a Chelsea shirt. The Spaniard was caught in possession in his own half by Darren Fletcher, and the ball broke to Gardner who took one touch and in stride hit a dipping shot from 25 yards that beat Thibault Courtois and brought the Baggies back level. As the nerves continued to build within the Chelsea side, the match also began to turn into a rather niggly affair. 10 minutes before halftime, Claudio Yacob, who was already on a booking, hauled down Oscar near the halfway line, prompting the Chelsea players to plead for a second yellow from referee Anthony Taylor. Taylor was unmoved, and Yacob survived to continue the match. Undeterred, West Brom built on that goal and could have taken the lead when Salomon Rondon turned Chelsea captain John Terry in the penalty area, but fired just over the goal. Taylor, who ended up having a rather busy day, once more drew the ire of the Chelsea players and supporters when he blew for halftime after the Blues had initiated a counterattack from a West Brom corner. Still stewing after the break, the Diego Costa of the start of the season began to appear on the pitch. Perhaps still aggrieved by Taylor’s decision to end the half, and also perhaps wound up by his running battle with Jonas Olsson, Costa flew into a reckless challenge on Gardner and was perhaps fortunate to just be booked. Yacob didn’t help Costa’s mood either when near the hour mark, the Argentinian took down Costa near the edge of the penalty area and once again escaped a second booking. 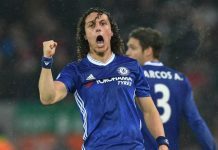 As Chelsea began to become more and more aggrieved at referee’s decisions and West Brom’s apparent time-wasting tactics, the visitors began to enjoy more and more possession and began to look more of a threat. Chelsea would break that momentum on 73 minutes when a brilliant counterattack saw an onrushing Kenedy beat Gareth McAuley to the near post, only for McAuley to divert Willian’s cross into the net and hand the Blues the 2-1 lead. But it wasn’t over just yet. Perhaps as an example of how the season’s gone for the Blues thus far, Chelsea failed to clear a corner, only for the ball to come back into the box, break to McClean on the edge of the area, and the midfielder placed his shot into the bottom right corner of the net to earn a point for the Baggies.